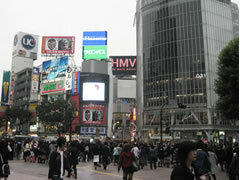 Shibuya is the centre for the latest entertainment, music, movies and fashion! It is full of energy and you can have fun just walking around, enjoying the display windows and people-watching! Shibuya is the place for the latest of everything. The energy that emanates from this meeting place of nature and people will bring out the best in you. Please enjoy your student life to the fullest in this amazing environment. At Shibuya 109, there are about 100 stores where you can purchase the latest fashion items from amongst the most popular brands. Every weekend, there are events held at the entrance. Be fashionable by shopping at Shibuya 109! Kua'aina is a famous hamburger restaurant that is popular with the TSM Shibuya/DA Tokyo students as well as many celebrities and dancers. They have more than 15 varieties of hamburgers and sandwiches. It has been used as a filming location for the Nippon Television dramas, "Gal Circle" and "Just One Love". This park runs parallel to the JR Yamanote Line between Shibuya and Harajuku. The pedestrian bridge near the park has been used as a filming location for the TBS drama, "Kisarazu Cats Eye" and the Fuji TV drama, "The Flower Shop Without Roses". Miyashita Park is becoming synonymous with filming locations for dramas. Shibuya Boxx is a live venue that is used for professional artists' performances as well as for training for the TSM Shibuya and DA Tokyo students. The stage is used for live performances and auditions and the cafe next to the venue is often used as a location for TV programs.